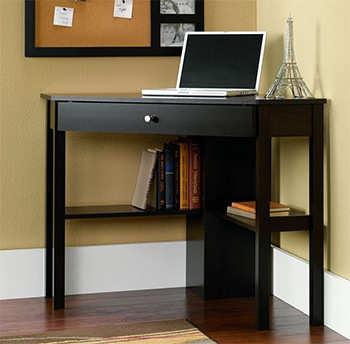 Corner desks offer a spacious work area with plenty of storage space. 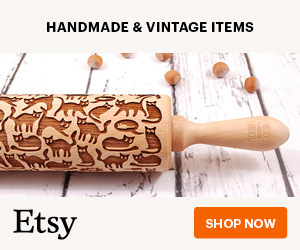 But there’s a lot to consider before buying one. In this guide I’ll share the best corner desks you can get covering size, shape, build material, and space used for shelving. If you want a corner desk and don’t know where to start then I promise this guide will help. 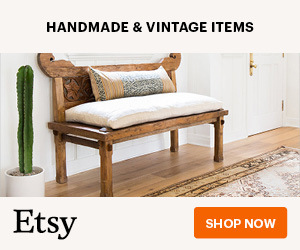 You can browse our top picks for the best corner desks in the above pricing table, or you can skip around to different desks using the table of contents below. Corner desks are just like any work desk, except designed to fit into a corner. They may be a lot larger and they may have extra features. But generally speaking they all have similar structures and they’re built with similar materials. 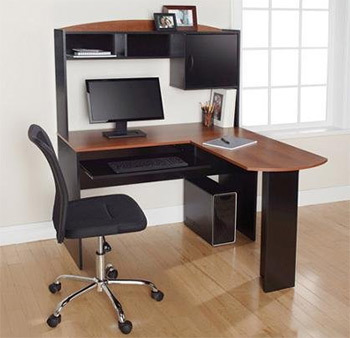 Corner desks can fit many more drawers and extra features compared to regular office desks. Because of this extra space you’ll want to measure your room to get a solid idea of how much space you’ll need. A corner desk usually feels spacious provided you have enough room in your home office. 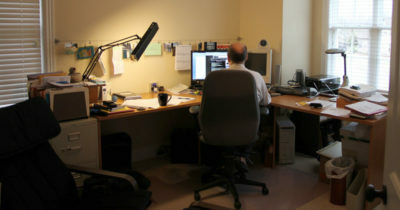 Even when tucked into a corner a larger desk can span 5 feet or even more. When you add in a chair you’ll see why measuring your space is crucial. Weight limits may also be a concern if you have dozens of books or devices or office supplies. But the vast majority of desks can handle 100+ lbs or more so this shouldn’t be a concern. Feel free to email the manufacturer if weight limit is an issue. But corner desks offer the most versatile working space with tons of storage and a true office feeling at home. 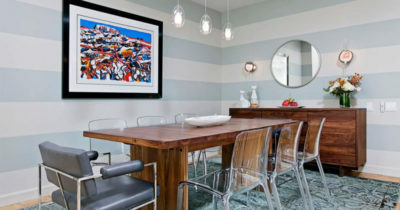 If you find a design you like on a desk that fits in your price range then don’t hesitate to pick it up. 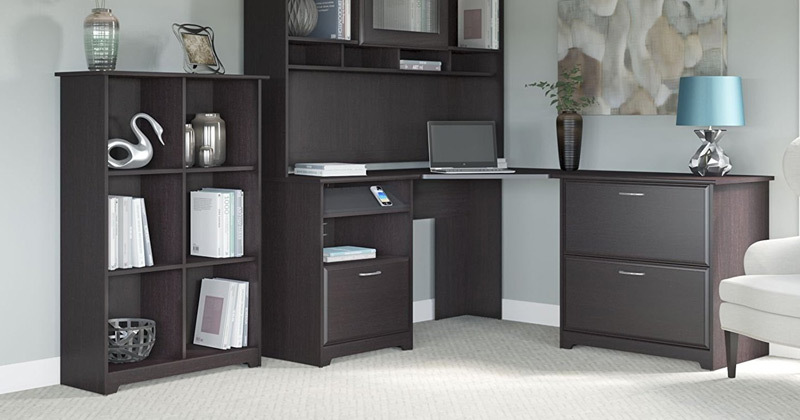 The Altra Dakota L-Shaped Desk comes with side cubbies, an attached bookshelf, and an optional hutch above the desk. It’s a big unit measuring about 4.5 feet long and wide. When it’s fully setup the desk almost takes up an entire square on the floor. It is a bit longer than wider so one end sticks out further, and you can rearrange the desk into whatever corner works best for you. It does not have a sliding keyboard tray so everything must sit flush on top of the desk. 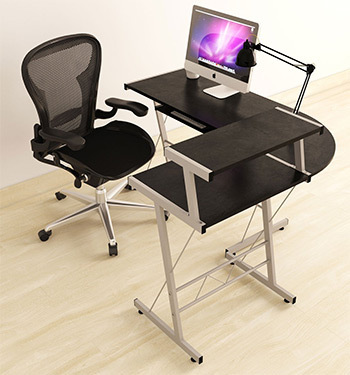 This desk top comes just over 2 feet above the floor so make sure your office chair can adjust to that height. You’ll also have some extra space on the side bookshelf with open shelving units. Here you can store anything from binders to office supplies or whatever you use in your daily work. In the two back corners you’ll find two grommets for feeding wires through the back. This makes wire management so much easier and lets you place a desktop computer tower underneath the desk with a monitor on top. The desk is incredibly sturdy and it has plenty of legroom underneath. It’s sturdy enough for regular office work and you shouldn’t ever be concerned about cracks in the wood. Overall the quality of this desk far exceeds the price. It’s a budget item that does not feel like a cheap purchase and you’ll get years, if not decades, of reliable use from this bad boy. Sauder makes the best computer desks on the market with so much variety. Their Harbor View Corner Desk is one such example that proves their level of diversity spans the gamut of many different products. This Sauder desk comes with a Salt Oak finish that looks antique yet modern. It has two storage compartments: one large door cabinet and another with 3 drawers. These can be swapped to either side so you have some control over positioning. What I like most about this desk is the sliding keyboard shelf with enough room for a keyboard and mouse. Sauder has a slightly different Harbor desk which places the keyboard drawer right in the corner wedge. Some people may prefer this design but I think it works better fixed to one side. Underneath the desk you’ll have plenty of legroom measuring about 22″ deep from the back to the front where you’ll be sitting. Both sides of the L shape measure about 65″ inches long(about 5.5 feet) and most features are adjustable like the keyboard tray and the two side fixtures. If you want even more space above the desk you can buy an optional Sauder Harbor Hutch built specifically for this desk. It can attach to either side and gives you even more freedom in the desk setup. The best thing about this desk is that it feels so professional. It may take a little while to get it all put together, but once you get it setup you’ll be amazed how great it looks. The small Beginnings Corner Desk is not a traditional L-shaped desk. It’s a mini-sized triangle that truly fits the definition of a corner desk. You’d buy this desk to save space and keep your work area tight. I know it’s not a great choice for everyone but minimalists may fall in love with the simplicity. It measures almost 4 feet across from end to end with a smaller 2 foot depth from the wall to your seat. It’s also surprisingly tall measuring about 30″ in height. But for such a small desk it does have a strong reinforced back leg to keep it sturdy and stable. This should hold any sized computer and it even has a small grommet hole for feeding wires through to the bottom. Also the desk’s shape is flat in the back corner so it’s not really a triangle. Instead it looks more like a trapezoid so you’ll have a small space between the end of the desk and the corner of the room. It doesn’t look weird though and you should have no trouble getting this desk fitted tight into the corner. In the very front you’ll notice a drawer with a small silver knob. Pull this down to access the sliding keyboard tray which holds your mouse, keyboard, and/or anything else you wanna store. And right underneath the desk you’ll see a few shelving units for books and other resources. These shelves also work as makeshift feet rests if you like your legs elevated. Weighing only 60 lbs and taking up a good 4-5 feet is the Sedalia Glass Office Desk. It does come in darker colors but the overall glass design and thin frame is built as-is with no options for change. The corner piece has a rounded section that bridges the gap between both ends of the desk. Across both sides you’ll get about 50″ across which should be plenty of space for a computer and some other trinkets. However the biggest question people have is the glass quality. The glass tabletop measures about ¼ inch thick and it uses an unattached design. It sits within the frame so it does have support, but it’s not going to feel as strong as MDF or particleboard(surprisingly). You should have no trouble fitting a laptop, iMac, or any other larger monitor onto this glass. The same goes for a keyboard, mouse, digital tablet, or anything similar. But you do need to be careful with larger monitors and other combined weight pushing 80-100 lbs or more. There is no official listing of max weight but you can email the manufacturer to get further details. From the ground to the desktop you have a little over 2 feet worth of space. This should be plenty for a typical office chair including space for the slide-out keyboard tray. The size of both sides is very reasonable and they feel sturdy. But the glass may be a dealbreaker for many people so I admit this desk is not for everyone. Another minimalist desk with a rounded corner is the Tribesigns L-Shaped Corner Desk. When put together it only weighs about 55 lbs and has a fixed height close to 30″. 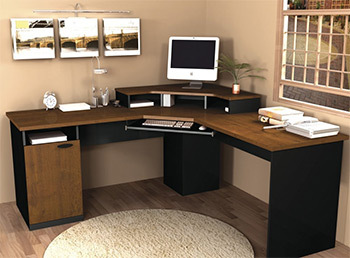 The desktop is made of particle board with a Teak/Oak finish. This wood measures about ¾ inch thick and is directly attached to the steel frame. It feel surprisingly durable even though it’s made of particle board. You’ll notice one side is a tad longer than the other making this a true L-shaped desk. The longer side measures about 47″ long and the shorter side measures about 30″. They’re both 20″ deep so the depth remains the same across the whole thing. Since this desk is very light it should be real easy to setup. 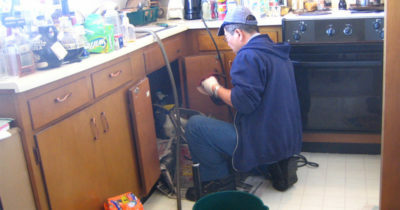 You don’t need any special tools and you can get the job done in under an hour. This desk is the minimalist’s dream because it’s sturdy enough to hold what you need, but not so thick that it’ll be heavy to pack up & move. One big downside is the lack of extra storage. This definitely isn’t a gamer’s desk or anything made for someone with lots of business binders, papers, or books. If you’re big on minimalism and like the design then you’ll be very pleased with this Tribesigns desk. Bush Furniture has some of the best desks for home. 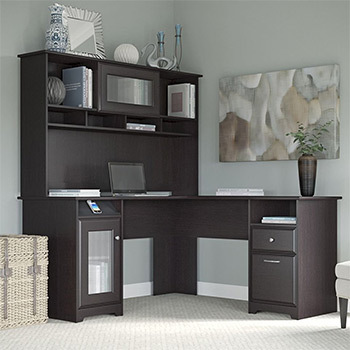 Their Cabot Collection L-Desk & Hutch is simply stunning in all facets: build, style, color, durability, and space. The desk is fully expandable with a top hutch, an optional side cabinet, and an optional cubby shelf for open storage. These items are designed to match the desk’s espresso oak finish. Each side measures about 60″ long which offers a tremendous amount of space. The L shape is perfectly square in the back so you can get this desk to sit flush with the wall. And the hutch can be moved to either side so you can fit this against any wall you wish. At it’s peak the hutch measures about 66″ tall from the ground. This equates to 5.5 feet tall, a massive desk by any standard. It’s also a heavy unit which means it won’t be easy to move once you get it setup. But this thing is a beast and it’s practically made for any home office. It comes with a USB cord holder to feed wires through and connect all your devices at once. Not only does this cord holder keep the USB cords accessible, but it also includes a 4-port USB connection built right into the desk. This works with a USB cord attached under the desk that you can plug directly into your computer. This way it behaves like an extended USB hub where you can quickly plug items into your computer without reaching around the desktop. Fluted glass covers the small door to the side and the closed hutch door. This glass is thick and blends beautifully with the other silver hardware in the desk. In regards to usability this desk is gorgeous. It really has so much room for everything you could possibly need, plus optional extras like a matching file cabinet also designed by Bush Furniture. If you want your home office to feel spacious and free-flowing then this L-shaped corner desk+hutch combo is the best thing you can get. It’s stunningly well-designed, simple to use, and brings a work-focused energy into the room that’ll make you excited to sit down and work every day. 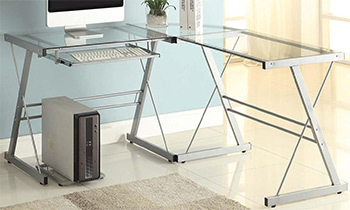 For a sleek design with a smaller build check out the BHG L-Shape Computer Desk. 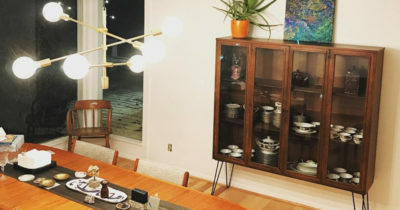 It’s pretty small and comes with a few different shelving styles that connect into the classic L shape. However the sides are fairly short measuring close to 3 feet in length, so this feels much more like a square. The top surface uses a composite wood and black laminate to create a sleek glossy look. The legs are made of a strong metal or metal alloy that keeps the desk feeling modern yet stable. Since this desk is so small it seems like the perfect choice for a cramped office. Not everyone has the luxury of a 4-story home and sometimes you’ll need to keep your office in your bedroom or living room. This BHG desk fits well in any environment. Setup can be a pain because there are a few different ways to connect this desk, plus you have the option to leave out some features like the top elevated shelf. This means you could have pieces left over and you may not be sure where certain pieces need to go. But once the desk is put together it works just like you’d expect. The steel legs come with rubber feet that keep everything firmly in place. And the surface measures just over 2 feet from the ground which should be perfect for any office chair. The Bestar Hampton Corner Desk has a tint of luxury over a modern design. 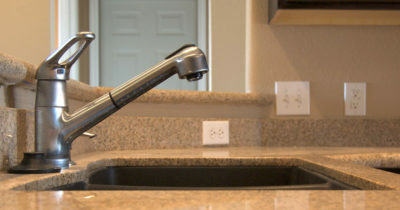 It’s made of engineered composite wood and finished with a durable laminate cover. In the very center you’ll find a flat surface rather than a pointy angle. This makes it easier to work on the slide-out keyboard tray and removes any major sharp edges from that center area. Even the riser is pretty sleek and has that blunted corner edge, however the back corner does have a 90° angle. You can place your computer monitor on top of the riser and feed cords down into the grommet. But note that you can choose to not install this monitor stand by just leaving it off the desk. This way you have a flat surface on the desk where you can place more than one monitor, or even add supersized monitors that may not fit on the stand. The raised stand only measures about 35″ wide on either side so it probably can’t hold more than one monitor. But if you don’t like the raised height just leave it off—problem solved. From the ground to the keyboard tray is about 2 feet so you can fit an office chair no problem. And with both sides of the desk measuring almost 6 feet long you’ll have tons of room on the desk top. If you really don’t like the monitor stand then check out a different desk like the Sauder Harbor. It doesn’t make a lot of sense to buy the Bestar Hampton if the monitor stand isn’t something you’re into. But you may like the center console design and you may like the centered keyboard tray too, plus this desk is pretty stable despite having thin rectangles for legs. Overall a great desk but it seems to target a specific audience. For a simple desk without much frill the Bush Somerset design is perfect. This comes with a lengthy 71″ width on both sides and plenty of storage space underneath including a hidden door and sliding drawers. Both of these storage areas can be flipped to either side and the keyboard mount can be moved as well. The desk is made of pressed particle board so it doesn’t have the richest wood, but it does feel incredibly sturdy. The polished veneer finish comes in three different styles. Tapered legs at the bottom keep this desk stable without feeling too heavy. It looks beautiful and has a stylish modern aesthetic. The side cabinets have two drawers: a top drawer for miscellaneous items and a bottom drawer as a folder/filing cabinet. Although you can ignore the filing rails and use this bottom drawer as just another storage spot. In the side flyout door you have plenty of space to plop a desktop computer. There is room to feed wires through behind the drawer, but you can also keep your desktop tower elsewhere and use the empty space for something else. This corner desk can even be expanded with other Somerset pieces like this top hutch designed specifically for the desk. It comes in all the same colors and matches up perfectly on either side. 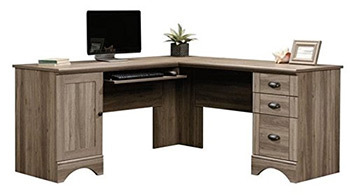 If you want a versatile corner desk for a luxurious home office then you have to check out this Somerset desk. It’s far from perfect but it has everything you’ll need to create a productive workspace. 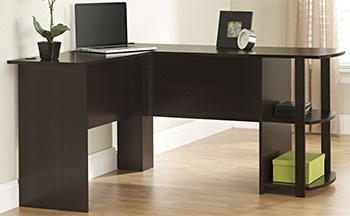 This Ameriwood Corner Desk is robust yet strong in build and appearance. The attached hutch adds a good amount of size to the desk hitting about 5 feet tall. But it’s also not super long or wide in either direction, actually looking a lot closer to a square. The back side with the hutch measures 47″ wide(about 4 feet) and the longer side perpendicular to the hutch measures closer to 50″. You should have plenty of space for a computer, some speakers, a printer and other knick-knacks. But this certainly isn’t the most spacious corner desk around. 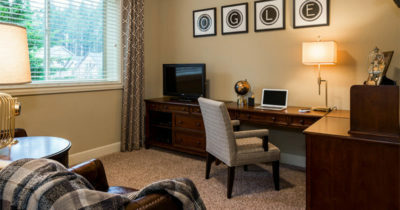 If you have a smaller home office then you probably won’t have room for massive 70″ desks. The hutch on this one grants you all that storage by adding space vertically rather than horizontally. You can store extra paper/books in the cubbies and other tech supplies in the closed cabinet. And this desk is stable enough to support stuff on the very top of the hutch as well. Just make sure your ceilings are above 6 feet high so you’ll have room up there. Down on the floor you won’t find any hidden compartments for storing your computer tower. Measuring from the back corner of the desk to your chair position is about 20″ and that should leave enough room for a tower. You also have the pull-out keyboard tray so that’ll add some distance too. Just looking at the legs you may not think they can hold much. But surprisingly this desk can support itself well and the materials feel durable. If you overload the side it can wobble a bit as you lean against it, although this shouldn’t happen if you don’t cram the surface with tons of stuff. This desk isn’t anything too fancy but what you see is what you get. Storage that would normally be underneath has been moved to the hutch and there’s still plenty of space for a tower below. 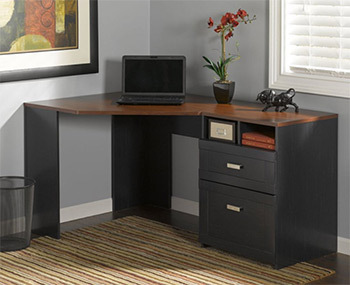 If you like the design and need a mid-sized corner desk then I recommend this Ameriwood model. It delivers a quality workspace and it certainly won’t break the bank. 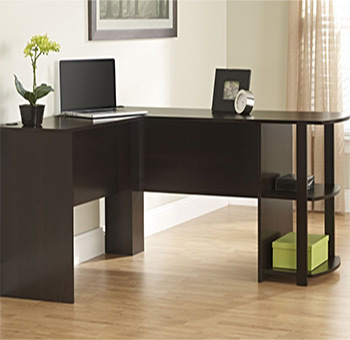 Flexible and easy to use best describes this Wheaton Reversible Corner Desk. 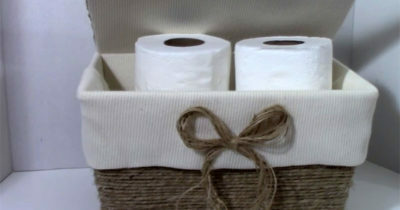 It comes with a reversible design so you can move the storage drawers to the right or left side. This way it can fit into any corner of the room with ease. Measuring the whole desk on the shorter side is 38″(a little over 3 feet). The longer side measures closer to 60″ which hits around 5 feet long. So in total this desk measures out to a 3×5 rectangle where you can place your chair on either side because it’s reversible. The pedestal side unit has 2 cubbies and 2 drawers. The larger drawer at the bottom is a file drawer so it should be used more like a filing cabinet. But all drawers measure close to 20″ deep which should be enough space for whatever you need. One thing to note is the small build of this desk will not leave much room on top. Even with the attached pedestal you can probably fit a monitor, mouse/keyboard, and a printer. But if that’s all you need then why push for anything larger? The build is stable and the back corner uses an edged piece to distribute weight evenly across the whole desk. You don’t need to spend a lot to get top quality craftsmanship. If you’re on a limited budget and need an affordable desk I highly recommend the Altra Dakota corner desk. It comes in a few different colors and they all have the same components. You get a shorter side measuring about 32″ long(about 3 feet) and a much longer side measuring 52.5″. The design is surprisingly sturdy and it should stand the test of time for years. It’s also incredibly simple and shouldn’t take more than an hour to setup. For desks in this lower price range you typically have to sacrifice storage. But surprisingly the Altra Dakota desk also comes with a side bookshelf that can store a few things in open shelving. This shelf certainly won’t hold the volume of a typical bookshelf but it’s better than nothing. If you do need to save some money when furnishing your new home office then I definitely recommend this desk. Just be sure to measure the room beforehand to make sure it’ll all fit! From the ground to the top area this desk measures 28″, or a little over 2 feet tall. It does not have a slide-out keyboard tray so make sure your chair can raise to this height to accommodate. 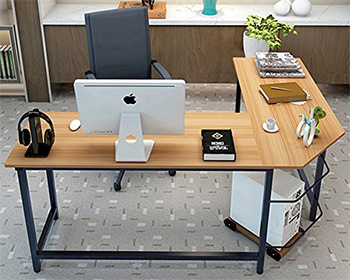 Now if you’re okay with a super-duper small corner desk then the Sauder Beginnings desk may be a better choice. It’s also very cheap but it drastically limits the amount of tabletop space. I think the average person furnishing their home office on a budget will be happy with the Altra Dakota L-shaped corner desk. Everyone has different needs for their home office so it’s tough to claim one desk is the absolute best. However from the corner desks I’ve looked into and reviewed I honestly feel the Cabot L-Shaped Corner Desk+Hutch is the #1 best pick. It has exactly what I look for in a desk and it looks very professional while also having that at-home feeling. Tons of storage space below, extra space above in the hutch, plus optional add-ons matching the desk’s veneer helped solidify this choice as my top pick. But this desk may be too big, or too pricey, or too flashy so it’s definitely not for everyone. Consider exactly what you’re looking for in a corner desk and be sure to measure your floor space. Once you have an idea of what you want it’ll be easier to pick a desk that’s right for you.